C. CAMERON Colin Fletcher CAMERON, b. 1881, "Dunan" Henty, S-W Vic., son of Donald CAMERON & Eliza FLETCHER. He was married in 1911 to Edith Muriel McLELLAN. He was a grazier of "Dunan" Henty, S-W Vic., married with 2 ch'n. when he enlisted in the AIF in May 1916 as Gnr 29720, Artillery Reinforcements, AIF. He embarked Oct 1916, served in France from 1917-1918 as Drv. 29720, 2nd Div. Ammunition Column, AIF and RTA in Aug 1919. His wife died at Sandford in 1931 and he died at Casterton in 1941 leaving at least 4 children. + H. CAMERON Hugh CAMERON, b. 1875, "Dunan" Henty, S-W Vic., son of Donald CAMERON & Eliza FLETCHER. He enlisted in Qheensland in 1902 and served in the Boer War as Tpr 1898, 3rd Battalion, Australian Commonwealth Horse (QLD). He was a married labourer of Geraldton, WA in 1916 when he enlisted in the AIF as Pte 3089, 16th Battalion, AIF. AIF. He embarked Nov 1916 from Fremantle, WA, served in France with the 10th Battalion & Tunnelling units, KIA by shellfire at Hazebrook, France in Apr 1918. He was married to Catherine McDERMOTT at Geraldton, WA in 1911. She died at Gerladton, WA in 1948. R. CAMERON Robert Miles Fletcher CAMERON, b. 1877, "Dunan" Henty, S-W Vic., son of Donald CAMERON & Eliza FLETCHER. He was a single, medical practitioner, aged 38y of Boulder, WA when he enlisted in the AIF as Capt. Australian Army Medical Corps, AIF. He embarked in 1915, served on Gallipoli and in France, RTA in 1916 and died in 1960. He married Anne WILSON or McPHERSON ? J. A. DOYLE John Andrew "Jack" DOYLE, b. 1893, son of Peter Patrick Doyle & Honora "Nora" COLEMAN. He was .... when he enlisted in the AIF as ...., AIF. He embarked ...., served in ...., RTA in ... and .... He married in 1920 at casterton, S-W Vic., to Mary Ellen HEENAN 1888-1968, daughter of Laurence HEENAN & Clara OUGH. Jack HEENAN died at Hamilton in 1966. H. IVY H.... IVY -----unidentified-----. NOTE : There was an IVY family living at Hilgay, near Coleraine in the late 1890s. They moved to Broken Hill, NSW & Port Pirie, SA. One son Allen Gordon Holmes IVY 1883-1917 was killed in France in 1917 and another son Ernest John Theodore IVY 1897-1967, b. Coleraine, S-W Victoria served with the AIF in France 1916-1918. Neither of these appear to match H... IVY on the roll, but they did have a sister Hilda Caroline IVY 1895-1984, b. Coleraine, S-W Vic. Was she a nurse in WW1 ...........? V. LARKIN Vincent Joseph LARKIN, b. 1898, Melbourne, Vic., son of Michael Edward LARKIN & Catherine Ann McGLONE. He was living at Henty, S-W Victoria in 1914. His brother Michael Edward LARKIN enlisted as Tpr 762, 8th Light Horse Regiment, AIF and was killed in the Light Horse Charge at "The Nek" Gallipoli on 7 Aug 1915. Vincent was a farmer, single, aged 18y of Tarwin Lower (Gippsland) when enlisted in the AIF in Nov 1916 as Pte 2609 Reinforcements, AIF. He embarked Feb 1917, in May 1917 he joined the 4th Light Horse Regiment, AIF in Egypt, served in the Middle East with the 4th Light Horse Machine Gun Squadron, AIF and RTA in 1919. He was married in 1929 to Ivy Elsie Alice HAYS ~1909-1979 and he died in Melbourne in 1976. H. J. ROULSTON Appears to be Herbert George Henty ROULSTON, b. 1893, Henty, S-W Vic., son of Joseph Heywood ROULSTON & Emily Kate MUNT. He was a 21 year old farmer of Gritjurk, Coleraine, S-W Vic., when he enlisted in the AIF in Aug 1914 as Tpr 175, 4th Light Horse Regiment, AIF. He embarked Oct. 1914 for Egypt, served at Gallipoli from May 1915, promoted to Cpl., hospitalised in Egypt, promoted to Sgt., RTA in Niv. 1916 with malaria and discharged in Dec 1917. He was married in 1925 to Daisy Ida EDMONDSON. J. R. SHADY James Rayner SHADY, b. 1897, Grassmere, near Warrnambool, S-W Vic., son of James Rayner SHADY & rachel JONES. He was an 18 year old farm labourer from Muntham, S-W Vic., when he enlisted in the AIF in Feb 1916 as Pte 3027, 29th Battalion, AIF. He embarked Apr 1916 from Melbourne, arrived Egypt, embarked Alexandria, Egypt, arrived Plymouth, England in Jun 1916. He served in France from Sep 1916 until 1918, RTA in 1918, discharged Mar 1919. He married Beatrice Ann Hartnoll PARKER 1899-1983, a teacher at Muntham S.S. in 1923. James SHADY died at Muntham in 1968 and was buried at Coleraine, S-W Vic. A. STOCK Alexander "Alick" STOCK, b. 1870, Muntham, S-W Vic., son of John STOCK & Christina McLENNAN. He was .... when he enlisted in the AIF as ...., AIF. He embarked ...., served in ...., RTA in ... and .... He died at Portland, S-W Victoria in 1947. D. STOCK Duncan STOCK, b. 1864, Hotspur, S-W Vic., son of John STOCK & Christina McLENNAN who by 1875 were living at "Quinberry" Muntham, near Carapook, S-W Vic. Duncan served in the Boer War in South Africa in 1901 in which his younger brother Tom was killed. He was .... when he enlisted in the AIF as ...., AIF. He embarked ...., served in ...., RTA in ... and .... He was married in 1894 to Mary Jane RICHARDS 1864-1951, daughter of Edward RICHARDS & Mary PORTLOCK. In 1915 he was one the STOCK Brothers who owned "Phoines" estate at Carapook. He died at Casterton in 1949. C. J. SYPOTT Charles James SYPOTT, b. 1898, Hotspur, S-W Vic., son of Charles Philip SYPOTT & Nancy KINGHORN of Muntham. He was a junior teacher at Penshurst, S-W Vic., in 1916, became a public servant by March 1916 when he enlisted in the AIF as Pte 3426, 2nd Pioneer Battalion, AIF. He embarked Dec. 1916, promoted to Cpl Sep 1917, served in France in 1918, RTA in Sep 1919. He was married in 1922 to Ella Victoria EALES 1896- ? and died in 1938 at Melbourne from effects of his war service. J. SYPOTT James "Jack" SYPOTT [M.M. ], b. 1897, Hotspur, S-W Vic., son of Charles Philip SYPOTT & Nancy KINGHORN of Muntham. He was a farm employee, single, aged 19y when he enlisted in the AIF as Pte 999, 39th Battalion, AIF. He embarked May 1916, served in France Nov 1916-1918, awarded MM for bravery in 1918, RTA and discharged in Niv 1919. He was married in 1922 to Honora Margaret COOKE, had 2 children and died from the effects of war service in 1933. + R. R. TAYLOR Robert Reginald TAYLOR, b. 1896, son of Thomas TAYLOR and Elizabeth SPONG. He was a farmer, single, aged 19y & 11m of "Wannon farm" Coleraine when he enlisted in the AIF in May 1916 as Pte 6354, 8th Battalion, AIF. He embarked in Sep 1916, served in France from Dec 1916, wounded Apr 1917, then wounded fatally 20 Sep 1917. W. J. TAYLOR Walter James TAYLOR, b. 1891, son of Thomas TAYLOR and Elizabeth SPONG. He was a single farmer, aged 24y & 5m of "Wannon Farm" Coleraine when he enlisted in the AIF in May 1916 as Pte 6353, 8th Battalion, AIF. He embarked Sep 1916, served in France from Dec 1916, promoted to L/Cpl. Cpl & L/Sgt until he RTA in 1919. He died at Clover Flat in 1973 and was buried in the Coleraine cemetery. W. R. TAYLOR William Russell TAYLOR, b. 1890, son of Thomas TAYLOR and Elizabeth SPONG. He was a single farmer, aged 25y in Apr 1916 when he enlisted in the AIF as Pte 1407, 39th Battalion, AIF. He embarked in May 1916, served in France from Nov 1916, wounded Apr 1917, returned to France and RTA fom England in May 1919 and discharged at Melbourne in Aug 1919. He was married in 1922 to Catherine Christina EDWARDS 1898-1980 of Merino. H. WOODALL Hugh WOODALL, b. 1897, son of George WOODALL and Adela HOLMES. 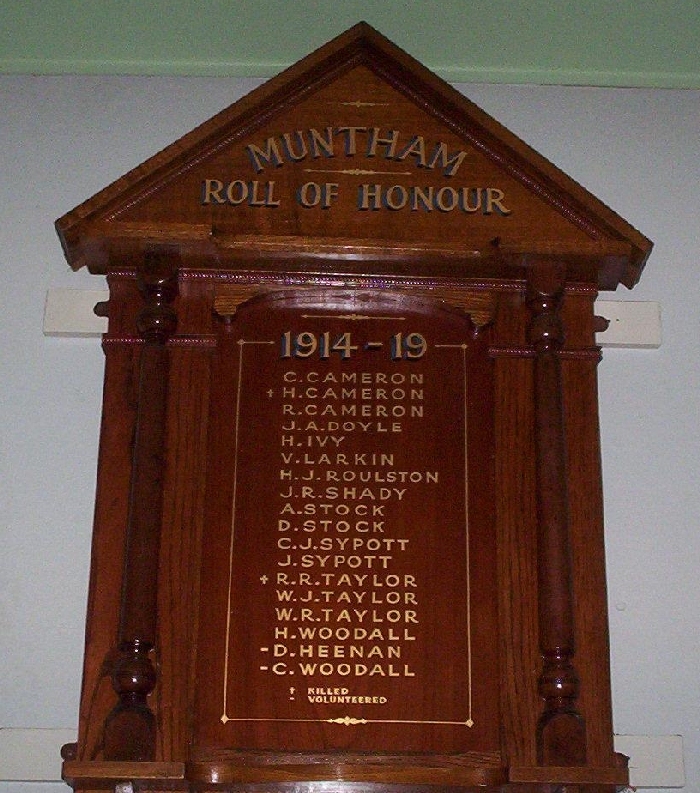 He was a labourer of Muntham in 1918 when he enlisted and served in the AIF as Pte 51731, 39th Battalion, AIF. He embarked Jun 1918, served in France in 1919 and was discharged at Melbourne in Sep 1919. He married Alice Ivy CRAIG 1894-1921 in 1921 and Violet May ROGERS 1904-1982 in 1925. D. HEENAN (volunteer) Appears to be Denis HEENAN, b. 1894, farmer of Muntham, son of Laurence John HEENAN and Clara OUGH, d. 1979, Casterton, S-W Vic. He was married in 1919 to Mary Catherine McSHEEHY 1897-1971, b. Sandford, S-W Vic., d. Casterton. C. WOODALL (volunteer) Appears to be George Ernest WOODALL, b. 1900, son of son of George WOODALL and Adela HOLMES. He was married in 1922 to Ida Alice JEFFRIES 1902-1969, of Casterton.